The Director-General of UNESCO, Irina Bokova, today urged the people of Libya and all those involved in the international art and antiquities trade to protect the country’s cultural heritage. 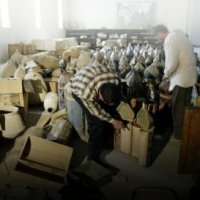 She also stated that looting, theft and the illicit trafficking of cultural property are manifestly in contravention of the 1970 UNESCO Convention on the Means of Prohibiting and Preventing the Illicit Import, Export and Transfer of Ownership of Cultural Property, the only international instrument focused exclusively on the fight against the illicit trafficking of cultural property. With this timeless truth in mind, I call on the people of Libya, on neighbouring countries and all those involved in the international art and antiquities trade to do all they can to protect Libya’s invaluable cultural heritage. I immediately contacted those countries and underscored the importance of the fight against the illicit trafficking and illegal export of cultural property." "Experience shows that there is a serious danger of destruction during times of social upheaval. It has taught us to look out for looting by unscrupulous individuals, that often damages the integrity of artifacts and of archaeological sites. Careless dealers who buy these objects and fragments are in fact inciting more looting. It is therefore crucial that the international antiquities market be particularly wary of objects from Libya in the present circumstances," Irina Bokova cautioned. Irina Bokova further offered UNESCO’s assistance in assessing reports of damage sustained by some of Libya’s five World Heritage sites and preparation of plans for their safeguarding, as soon as this becomes possible.